In a P&P extra, Keith Farr rides behind ‘A1’ No. 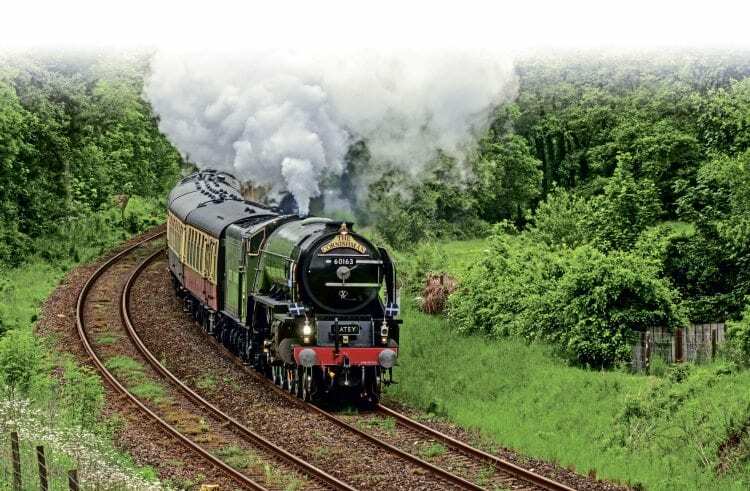 60163 Tornado on an epic journey from London to Cornwall – the first visit of the class to the Duchy. Although not everything on the day went to plan, the events that saw ‘A1’ Pacific No. 60163 Tornado head west from Paddington on May 29 were without precedent. Not only was it the first visit of an ‘A1’ Pacific to Cornwall, but the 6hr 46min booking for the 305¼ miles to Penzance, with five intermediate stops, was extremely challenging, while the 1hr 58min schedule from Plymouth to Penzance was the fastest ever for steam. It was in the capable hands of DB Cargo driver Graham Ward, fireman David Proctor and traction inspector Don Clarke that Tornado quietly moved the 11-coach ‘Cornishman’ away from Paddington’s platform 1. However, this was not a traditionally gentle ‘Paddington start’, for the Pacific was making 66mph by Ealing Broadway and 74 as early as Southall: a ‘Bristolian’ getaway, but with 430 tons instead of about 260. Unchecked, we were 3½min early arriving at Reading’s platform 10, having crossed cautiously from the Down main line at the approach to the station. We then passed under the Didcot line flyover to Reading West and the former Berks & Hants line, with speed rising to 44mph at Southcote Junction and 71mph before the first water stop, at Newbury. On the rising gradients alongside the resuscitated Kennet & Canal towards Savernake, a maximum of 69mph through Bedwyn was followed by a slight easing for Grafton curve, and the short 1-in-106 to the summit was mounted at 63. Downhill into Wiltshire, driver Ward allowed speed to reach 76mph before braking to 36mph for a clearance slack at Pewsey, Tornado’s soft three-cylinder exhaust beats then merging into a determinedly loud ‘purr’ as we raced down to the Vale of Westbury. apple-green Pacific was hard at it for the rise to Clink Road Junction, at the start of the Frome cut-off, speed falling only from 74 to 68mph on this short length at 1-in-151. After mounting Brewham summit at 65mph, we enjoyed a glorious gallop down the winding Brue Valley, through Bruton and past traces of the old Somerset and Dorset line, at up to 78mph. A slight slack through Castle Cary was followed by unimpeded progress across the Somerset flats to Cogload, where we passed under the Bristol line flyover at 70.